Customers on software maintenance can download and install v10.2.0.195 of the Predator CNC Service from our ftp site at any time. Customers running v9 or older of Predator CNC Service should contact their local Predator VAR or Mike Sizemore at mikes@predator-software.com for upgrade details and pricing. Customers on software maintenance can download and install v10.2.0.194 of the Predator CNC Service from our ftp site at any time. Customers running v9 or older of Predator CNC Service should contact their local Predator VAR or Mike Sizemore at mikes@predator-software.com for upgrade details and pricing. Customers on software maintenance can download and install v10.2.0.191 of the Predator CNC Service from our ftp site at any time. Customers running v9 or older of Predator CNC Service should contact their local Predator VAR or Mike Sizemore at mikes@predator-software.com for upgrade details and pricing. Customers on software maintenance can download and install v10.2.0.188 of the Predator CNC Service from our ftp site at any time. Customers running v9 or older of Predator CNC Service should contact their local Predator VAR or Mike Sizemore at mikes@predator-software.com for upgrade details and pricing. Customers on software maintenance can download and install v10.2.0.182 of the Predator CNC Service from our ftp site at any time. Customers running v9 or older of Predator CNC Service should contact their local Predator VAR or Mike Sizemore at mikes@predator-software.com for upgrade details and pricing. Customers on software maintenance can download and install v10.2.0.178 of the Predator CNC Service from our ftp site at any time. Customers running v9 or older of Predator CNC Service should contact their local Predator VAR or Mike Sizemore at mikes@predator-software.com for upgrade details and pricing. Customers on software maintenance can download and install v10.2.0.174 of the Predator CNC Service from our ftp site at any time. Customers running v9 or older of Predator CNC Service should contact their local Predator VAR or Mike Sizemore at mikes@predator-software.com for upgrade details and pricing. Customers on software maintenance can download and install v10.2.0.171 of the Predator CNC Service from our ftp site at any time. Customers running v9 or older of Predator CNC Service should contact their local Predator VAR or Mike Sizemore at mikes@predator-software.com for upgrade details and pricing. Customers on software maintenance can download and install v10.2.0.149 of the Predator CNC Service from our ftp site at any time. Customers running v9 or older of Predator CNC Service should contact their local Predator VAR or Mike Sizemore at mikes@predator-software.com for upgrade details and pricing. Customers on software maintenance can download and install v10.2.0.142 of the Predator CNC Service from our ftp site at any time. Customers running v9 or older of Predator CNC Service should contact their local Predator VAR or Mike Sizemore at mikes@predator-software.com for upgrade details and pricing. Customers on software maintenance can download and install v10.2.0.139 of the Predator CNC Service from our ftp site at any time. Customers running v9 or older of Predator CNC Service should contact their local Predator VAR or Mike Sizemore at mikes@predator-software.com for upgrade details and pricing. Customers on software maintenance can download and install v10.2.0.138 of the Predator CNC Service from our ftp site at any time. Customers running v9 or older of Predator CNC Service should contact their local Predator VAR or Mike Sizemore at mikes@predator-software.com for upgrade details and pricing. Customers on software maintenance can download and install v10.2.0.137 of the Predator CNC Service from our ftp site at any time. Customers running v9 or older of Predator CNC Service should contact their local Predator VAR or Mike Sizemore at mikes@predator-software.com for upgrade details and pricing. Customers on software maintenance can download and install v10.2.0.135 of the Predator CNC Service from our ftp site at any time. Customers running v9 or older of Predator CNC Service should contact their local Predator VAR or Mike Sizemore at mikes@predator-software.com for upgrade details and pricing. Customers on software maintenance can download and install v10.2.0.131 of the Predator CNC Service from our ftp site at any time. Customers running v9 or older of Predator CNC Service should contact their local Predator VAR or Mike Sizemore at mikes@predator-software.com for upgrade details and pricing. Customers on software maintenance can download and install v10.2.0.127 of the Predator CNC Service from our ftp site at any time. Customers running v9 or older of Predator CNC Service should contact their local Predator VAR or Mike Sizemore at mikes@predator-software.com for upgrade details and pricing. Customers on software maintenance can download and install v10.2.0.126 of the Predator CNC Service from our ftp site at any time. Customers running v9 or older of Predator CNC Service should contact their local Predator VAR or Mike Sizemore at mikes@predator-software.com for upgrade details and pricing. Customers on software maintenance can download and install v10.2.0.73 of the Predator CNC Service from our ftp site at any time. Customers running v9 or older of Predator CNC Service should contact their local Predator VAR or Mike Sizemore at mikes@predator-software.com for upgrade details and pricing. Customers on software maintenance can download and install v10.2.0.72 of the Predator CNC Service from our ftp site at any time. Customers running v9 or older of Predator CNC Service should contact their local Predator VAR or Mike Sizemore at mikes@predator-software.com for upgrade details and pricing. Customers on software maintenance can download and install v10.2.0.71 of the Predator CNC Service from our ftp site at any time. Customers running v9 or older of Predator CNC Service should contact their local Predator VAR or Mike Sizemore at mikes@predator-software.com for upgrade details and pricing. Customers on software maintenance can download and install v10.2.0.59 of the Predator CNC Service from our ftp site at any time. Customers running v9 or older of Predator CNC Service should contact their local Predator VAR or Mike Sizemore at mikes@predator-software.com for upgrade details and pricing. What is Advanced Machine Connection? Enable this option to automatically determine when the machine is powered on or off. Typically, when off we assign this to a No Response downtime. Why is the Test Button greyed out? 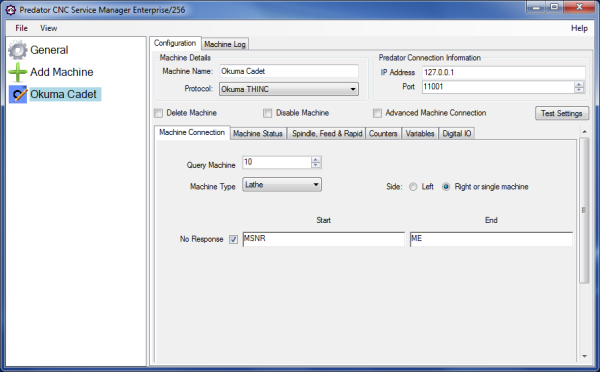 Some protocols are single threaded and when this occurs it means that the Predator CNC Service is already running. Stop the Predator CNC Service and the Test button will become available for use.